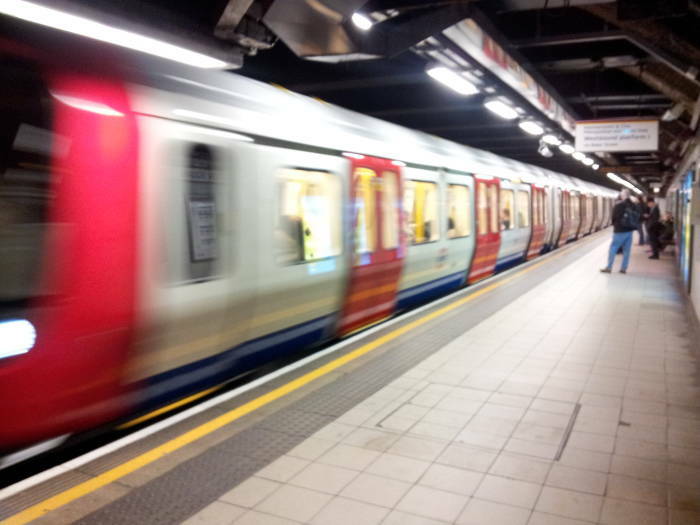 The London Underground system is a great (although expensive) way to travel around the city, once you figure out what to call it and how to use it. George Bernard Shaw famously said that the British and the Americans are two peoples separated by a common language. Oscar Wilde wrote in The Canterville Ghost that "Indeed, in many respects, she was quite English, and was an excellent example of the fact that we have really everything in common with America nowadays, except, of course, language." "Would you like a biscuit?" To an American the British version seems to have either one word too many or one too few. The same happens with "I will have", "I have done", and similar distinctly British constructions. More on that reference in a bit. 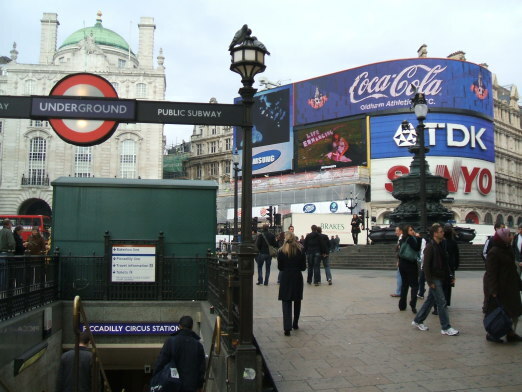 Here we see one of several entrances to the London Underground system in Piccadilly Circus. Americans should stop looking for the animals and acrobats, circus is a Latin term for "circle", meaning that this is a round open space at the very busy intersection of several streets. Also see Cambridge Circus and Oxford Circus in London. Notice that the sign above the entrance says both UNDERGROUND and PUBLIC SUBWAY, but be aware that those refer to two very different things. 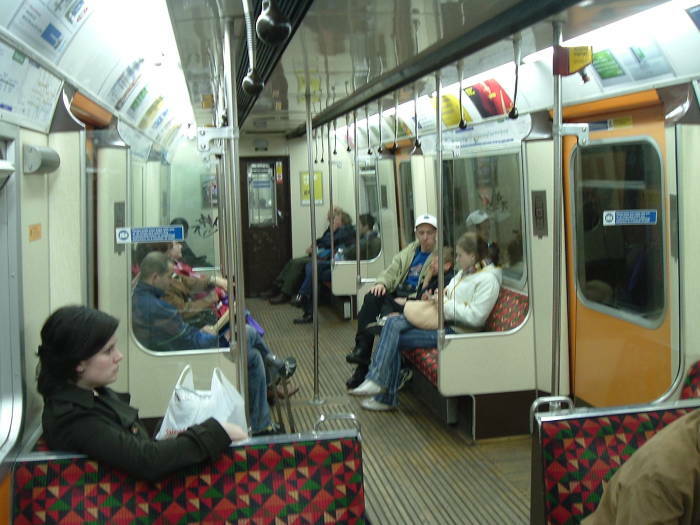 A subway in British English is an subterranean foot passage allowing pedestrians to cross under busy roads or intersections. 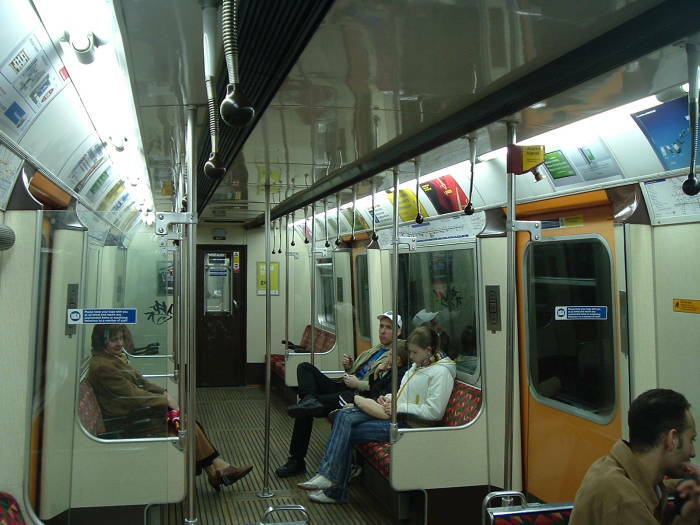 The underground is a subterranean railway system. 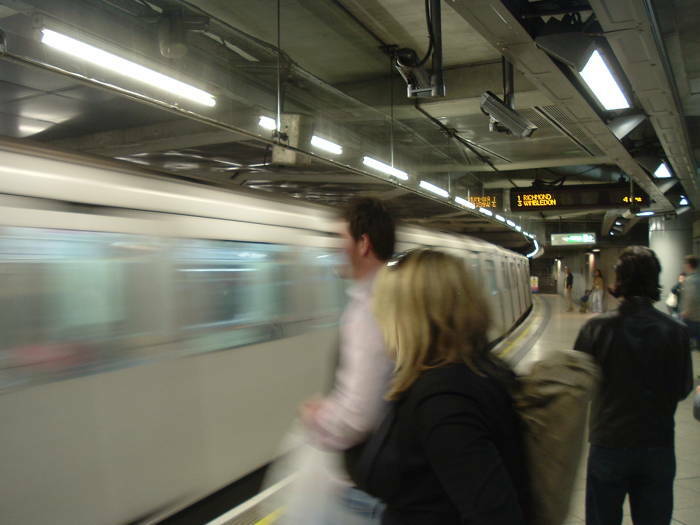 Or at least partly subterranean — less than half of the London Underground is actually underground. Much like the New York Subway system, the London Underground began and developed as a collection of separate lines that merged into one gigantic system years later. The first of these, the world's first underground railway, was Metropolitan Railway joining Paddington and Farringdon. It carried 38,000 passengers on its opening day in January, 1863. The trains used coal-fired steam locomotives pulling carriages lit by gas, not very safe or clean by today's standards. The early lines were all built with the "cut and cover" method. Excavate a large trench, build a railroad down there, and then cover most of it over. Many of the older lines are exposed in places, especially around the stations. This provided ventilation essential for the operation of coal-fired steam locomotives and gas lights underground. 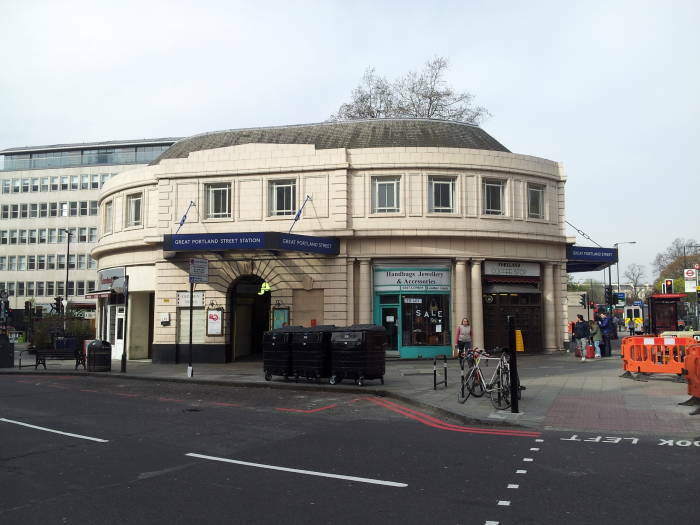 Here is the Earl's Court station south and west of the Kensington district. A roof with skylights keeps the weather off the platforms, but the line is open to the sky just west of the station. Electrification started in 1890 and continued through the 20th Century. As the lines were separate operations run by independent companies, a variety of both AC and DC voltages was used. 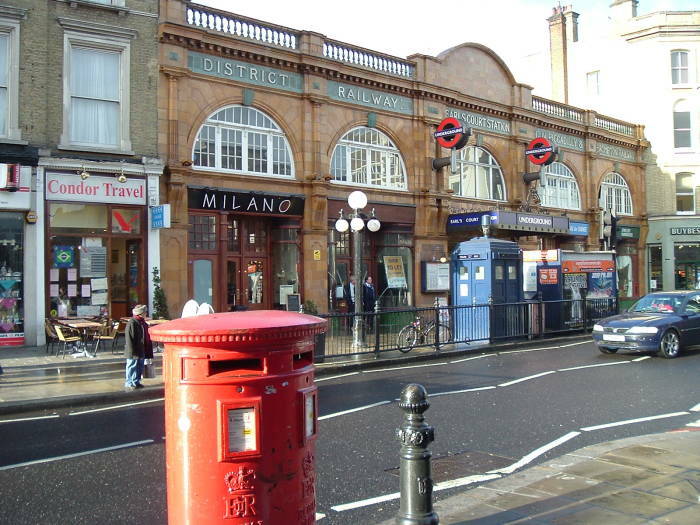 The Kensington station, seen below, has a somewhat Victorian era design with its brick arches. It is entirely underground, although you see in the second picture below how the line is uncovered in the distance. 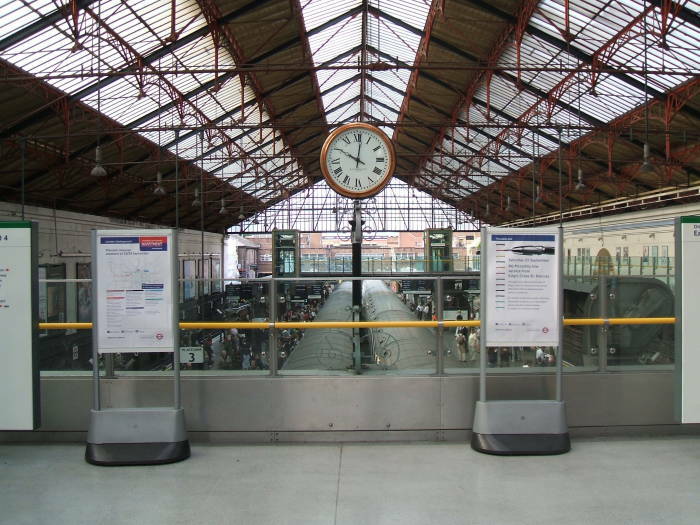 The older stations are accessed via short flights of stairs. The later lines were tunneled through the clay soil beneath London. 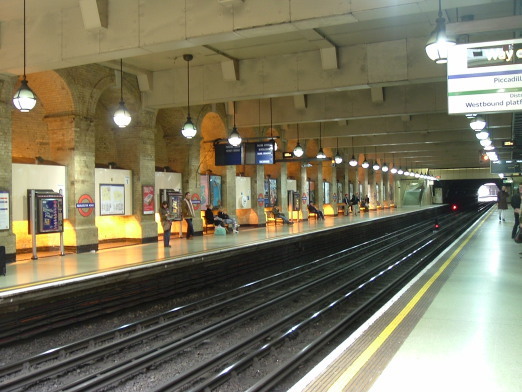 The circular cross-sections of the tunnels led to the informal name of The Tube. Newer lines are tunneled at greater and greater depths and are accessed via escalators and elevators. The station and track on the District and Circle lines seen below are exposed, although they lie well below the local ground level. The various and sundry private companies owning and operating the Underground lines were merged into the London Passenger Transit Board in 1933. 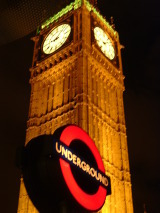 Transport for London or TfL was formed in 2000 and it assumed control of the London Underground in 2003. 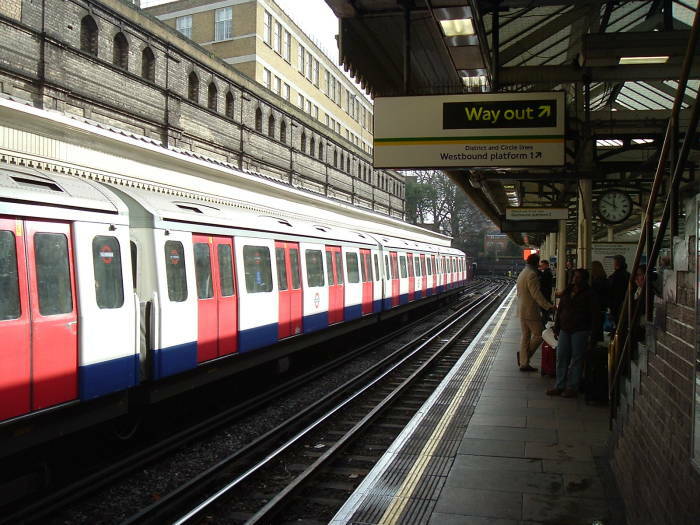 The London Underground system is now the fourth longest metro system in the world, consisting of eleven lines with 402 kilometers of track serving 270 stations. Just 45% of the system is below the surface, with 32 kilometers of near-surface cut-and-cover and 150 km of much deeper tube tunnel. The deeper lines use smaller trains with more circular cross-sectional shape moving through paired tubes of 3.56 meter diameter. Power is provided through a four-rail DC system. The main rails supporting the train are at electrical ground. Here we go again — British electrical engineers speak of earthing a conductor, perhaps through an earth pin on a plug, so the main running rails are earthed. American electrical engineers would instead ground those rails. The center conductor rail is at –210 V and a conductor rail outside the running rails is at +420 V, providing 630 V DC power to operate the trains. Many of the Tube stations are architecturally interesting. Seventy out of the 270 London Underground stations are in "listed buildings", an initially mysterious term for us foreign visitors meaning that they are on the Statutory List of Buildings of Special Architectural or Historical Interest, while five more have their entrances in listed buildings. 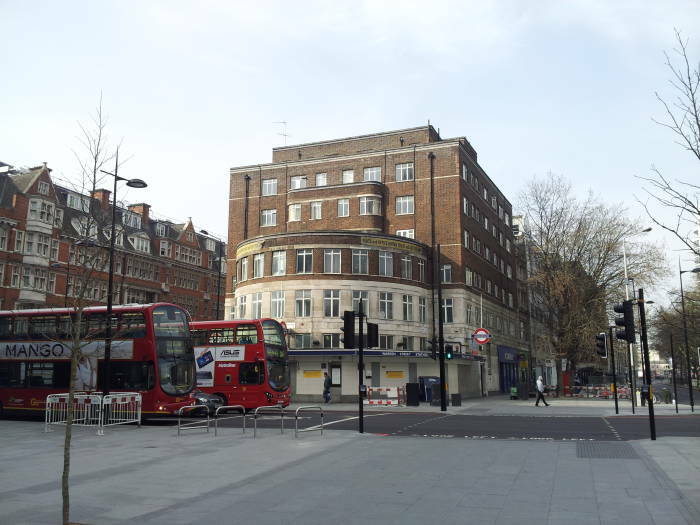 The rounded end of the first building shown here encloses the Warren Street Tube Station where Tottenham Court Road (on which these two double-decker buses are traveling) meets Warren Street as it becomes Euston Road. The smaller building in the second picture houses the Great Portland Street Station. This is one of the "listed buildings". 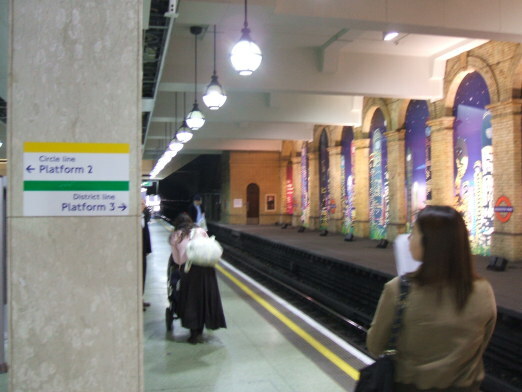 A station opened here on 10 January 1863 as part of the first underground line. The current building was completed in 1930 on a traffic island in Marylebone Road where it intersects with Great Portland Street and Albany Street. Continuing in the direction we're looking, Regents Park is off to our right in the following block. London is an ancient city but its architecture continues to modernize and evolve. 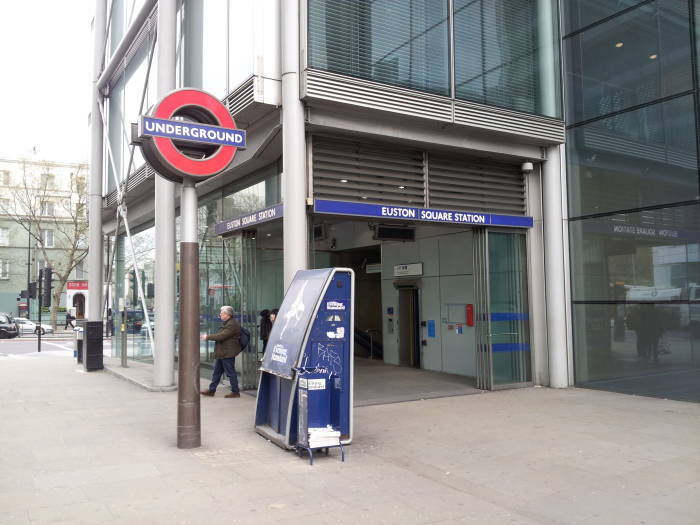 This is one entrance to the Euston Square Station. Other entrances are on the other side of Euston Road, joined by those handy subway pedestrian passages. Parts of what became the unified London Underground have used a roundel emblem since 1905. The red ring version has been a registered trademark since 1917. It may have been an inspiration for the RAF roundrel instead of things being the other way around. The distinctive use of sans serif font and the schematic map, developed in 1933, have been very influential in the field of design. 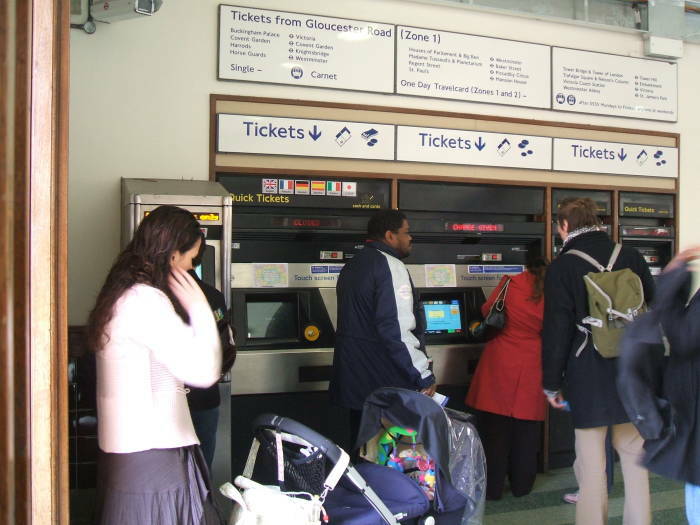 We enter a Tube station by stairs, possibly by escalator or even elevator (or lift) in some modern stations, and before long we have reached the ticket machines. 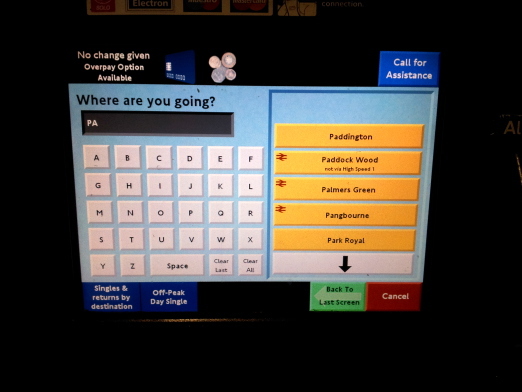 The first ones shown here are in the Euston Square station, those below are in Kensington. London is a very cosmopolitan city. 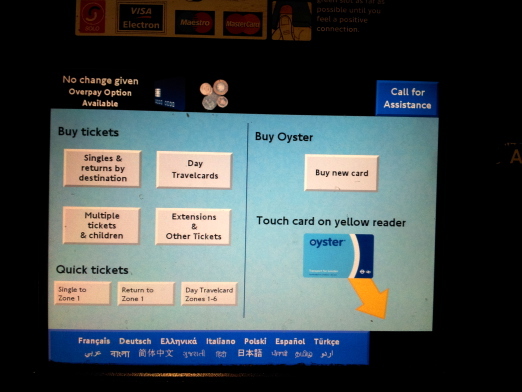 If you haven't noticed that by the time you get to the Underground ticket machine, you should notice it then through the choices of languages offered. French, German, Greek, Italian, Polish, Spanish and Turkish from Europe, plus several languages from the Indian subcontinent and East Asia. 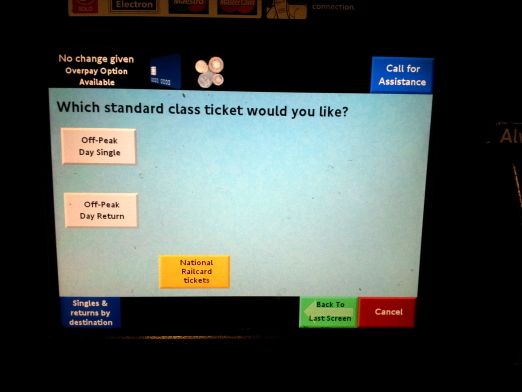 The initial screen offers single and return tickets. Single and return in British English correspond respectively to one-way and round-trip in American English. Just as on the inter-city rail system, return tickets cost just a little more than single tickets, a trip out and back costs a little more than a trip one way and far less than twice as much. 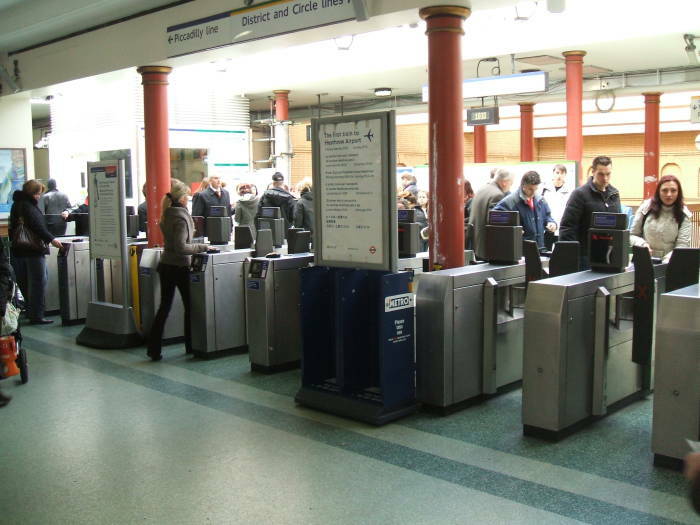 Oyster is a contactless RFID system that you pre-pay with credit and use as you ride. Single trips cost less than they would with a paper ticket. 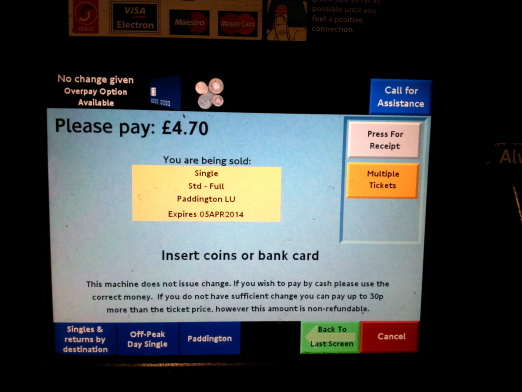 The cost for all your trips for one day are capped at the price of an unlimited Day Travelcard. I'm on my way out, flying back to the U.S., so all I need is a single ticket to Paddington Station to connect to the Heathrow Express. It's Saturday morning, so Off-Peak prices apply. The cost depends on the distance, based on the number of concentric zones crossed. The central Zone 1 is based on the Circle Line's loop plus a few stations south of the Thames. Most of the stations including Heathrow Airport are within zones 1 through 6. The only stations in zones 7, 8 and 9 are outside Greater London, beyond Moor Park on the Metropolitan Line. 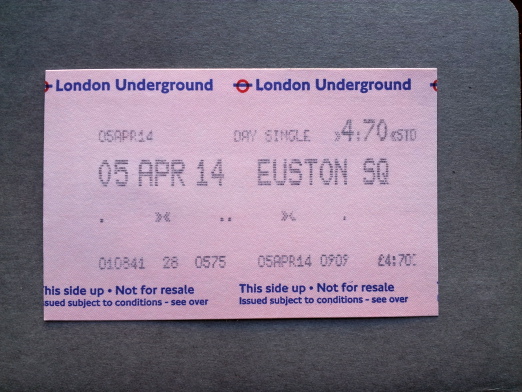 Even though it's an off-peak single ticket limited to just the central Zone 1, it still costs £4.70! 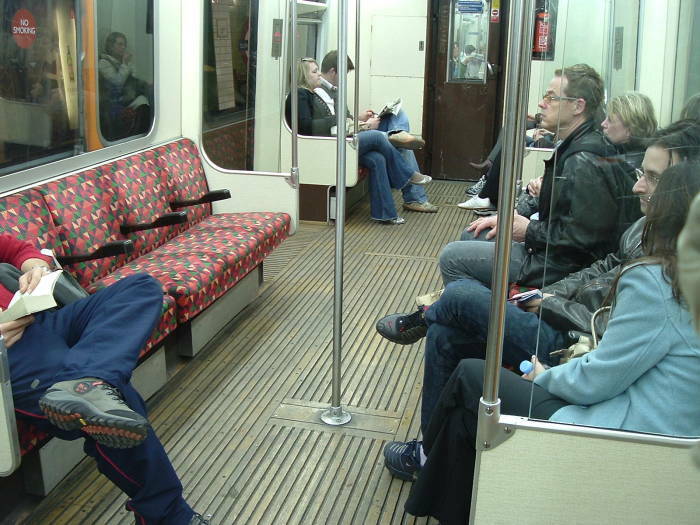 Single rides on the Tube are very expensive. 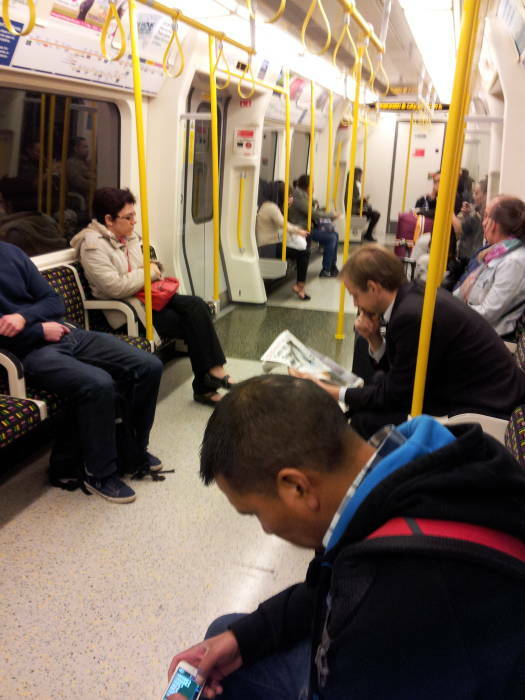 If you are going to do much within one day, an unlimited Day Travelcard is a much better deal. Also note that taxis are very well regulated within London, and often are significantly cheaper than the Tube fare for a group of three or sometimes just two people. But it's just me, and I'm only going to Paddington Station to connect to a departing plane, so this is the least bad option. 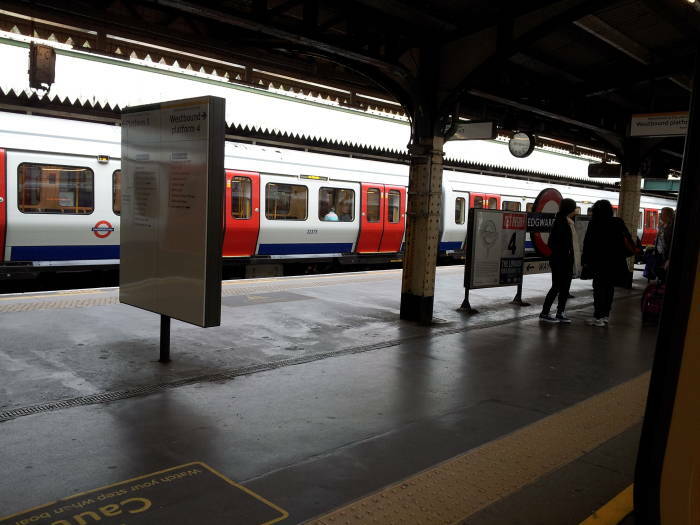 The shortest distance between two stations is 300 meters between Covent Garden and Leicester Square on the Piccadilly Line. £4.70 for 300 meters works out to £15.67 per kilometer. At that rate it would cost over £8,300 to travel to Edinburgh (about 530 km), or £84,618 for the 5,400 km to New York. 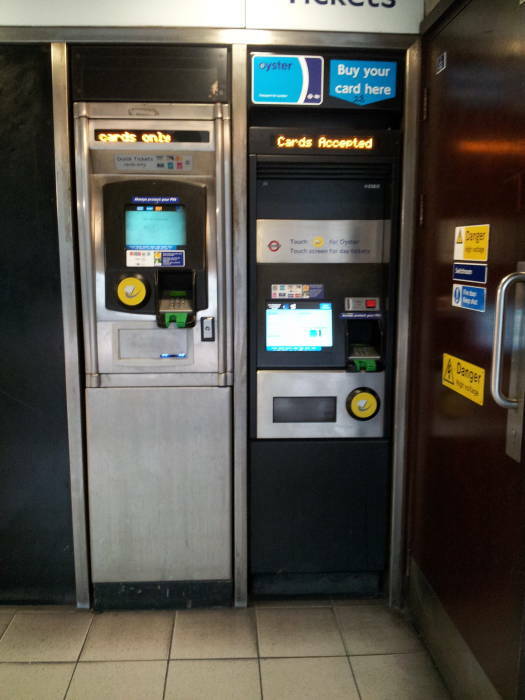 If you have an Oyster card, touch it (or the wallet or purse in which you carry it) to the yellow reader disks on top of the turnstiles. If you have a pink card like mine above, feed it into the slot on the front of the machine. Then take it from where it pops out of the slot on the top. The barriers swing open, step through. This is Britain so traffic generally moves on the left. This includes on the roads, on the rail lines, and in the Underground turnstiles. 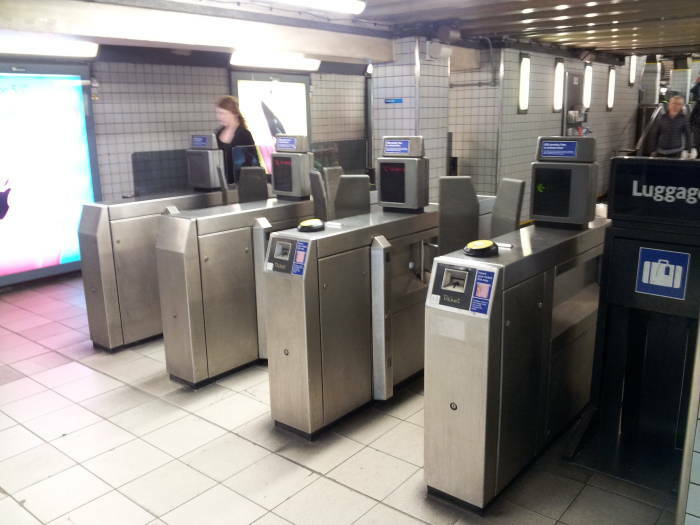 Touch your Oyster card or send your paper farecard through the turnstile to get out at the other end. Here comes our train, it's time to get on board. 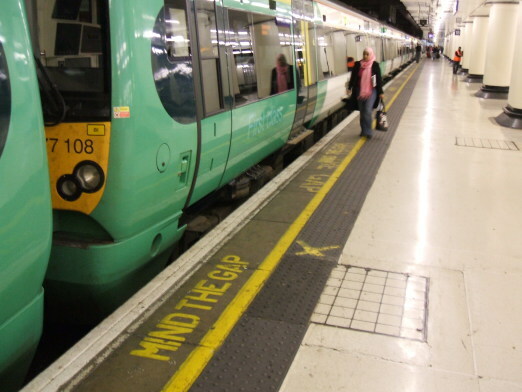 Platforms may bend but rail cars can't, so there may be a gap of up to a foot between the train and the platform. There may also be a vertical mismatch between the levels of the platform and the decking within the train car. Around 1968 the London Underground wanted an automated announcement. Solid-state equipment playing a digital recording was expensive at the time, so brevity was key. 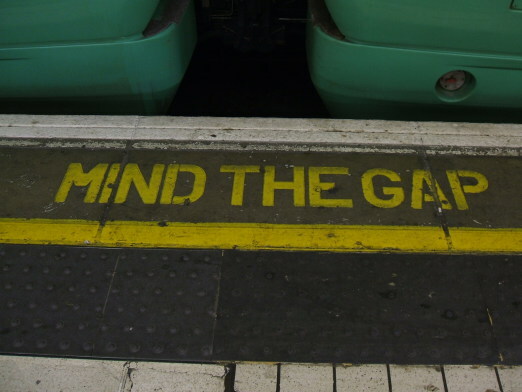 A short phrase would also be easier to stencil onto platform edges. 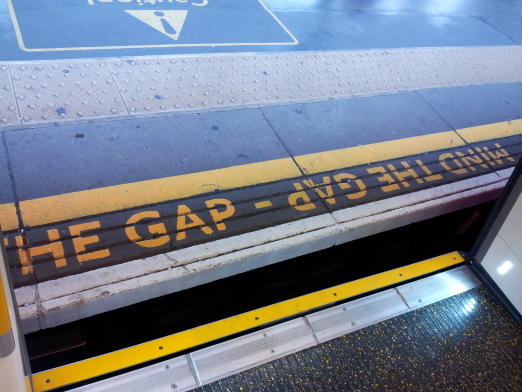 MIND THE GAP was coined. 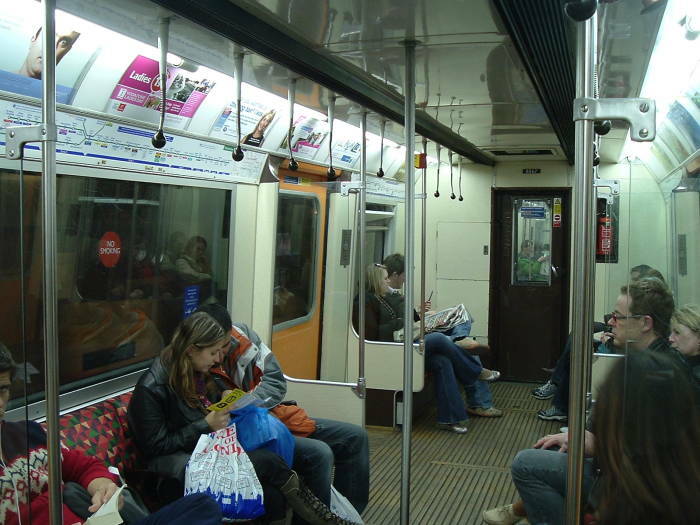 Versions are now heard on the Paris Métro, the Hong Kong MTR, the Athens Μετρο, the New York MTA, and many other public transportation systems.